Shared belief in the "Golden Rule"
Celebration of "Golden Rule Day"
for this is [the essence of] the Law and the [writings of the] Prophets. do ye even so to them: for this is the law and the prophets." for this sums up the Law and the Prophets. A photoshopped "Golden Rule Bus"
This bus image was altered to display "The Golden Rule" on its front. The Ethic of Reciprocity -- often called the Golden Rule -- simply states that all of us are to treat other people as we would wish other people to treat us in return. "Join us on Thursday, April 5, for a 24-hour global virtual celebration of the Golden Rule; a universal principle shared by nearly all cultural, spiritual, religious, and secular traditions on Earth. Over the course of 24 hours, people from many corners of the world will address “Why the Golden Rule Matters Now” as they share how people, organizations and governments can use this Common Principle to create a better world for everyone. 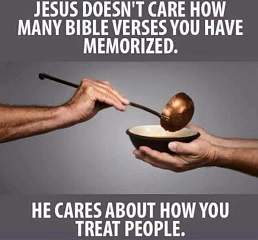 "We live by the #GoldenRule: Treating others like we’d like to be treated. It has always been our guiding principle." Their web site includes stories of "GoldenRule moments." 6 They are well worth reading. One example is below. Quotations about the Ethic of Reciprocity/Golden Rule. Background. Failure of religions. Why the Ethic of Reciprocity is particularly important now. Passages from the texts of various religions, from the writing of philosophers, etc. Part 1: Quotes from religious texts in 14 world-wide religions from the Bahá'í Faith to Satanism. Part 2: Quotes from eight more religions from Shinto to Zoroastriansm. and other sources. Additional passages from religions, philosophers and moral/ethical systems. 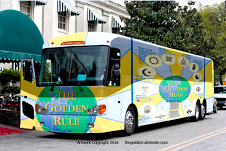 Books, videos, a poster, and T-shirts about the Golden Rule. Exceptions to the Golden Rule. 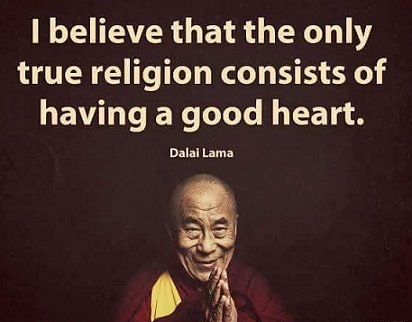 Using the Golden Rule(s) to teach religious tolerance and understanding. Is it OK to harm a few people in order to benefit the majority? An essay donated by Contributing Editor Susan Humphreys: Live and let live. The source of this poster is unknown. I found it posted on a Facebook group. Posted by Ayurveda by Curejoy.